We’re very fortunate to be supported by Thames enthusiast Helen Charlton this summer, as she embarks on a Source to Sea challenge. A gruelling 185 miles/298 km awaits Helen which she plans to complete on foot, paddleboard, Kayak and Row, finishing her journey at AHOY. Helen has set herself the target is to raise £15,000, which will fund an apprentice at AHOY, providing an NVQ L2 Certificate in Activity leadership/outdoor activity leadership, and giving one young person a chance in life that they would otherwise not have had. ‘I live near the Thames in Putney and my work involves the river. AHOY uses so well the challenge and enjoyment of being out on our mighty Thames and I’ve seen in my children how this helps build personal resilience, self-esteem and valuable life skills. Helen has been walking, paddleboarding and kayaking along the Thames on her 300km journey from the source. She is half way there, having reached Reading, with the final push to London next month reaching Putney on 23rd September and rowing to the Barrier with AHOY on 26th. 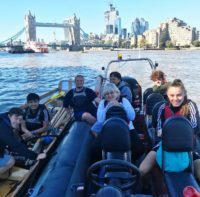 Completing my journey by rowing from Tower Bridge to Woolwich turned out to be quite a challenge in the strong sunshine and heat, and I lost count of how many crabs I caught-but it was an absolute blast! I had met most if not all of the apprentices when I visited AHOY earlier in the year, and it was remarkable to see how their confidence, camaraderie and sense of well being-plus their boat skills-had developed. They were such a positive group of young people and I felt so proud of them all, and so privileged to have witnessed and, in my own way, to have been part of their journey. It all demonstrated so clearly what AHOY delivers, and what my fundraising has been about.